Go to Blockly pond challenge page. 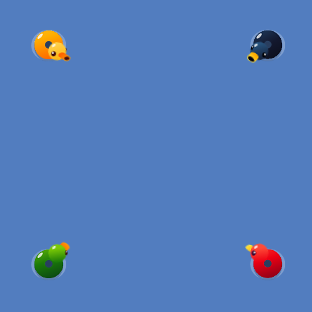 In this lesson you will be facing 4 ducks and you need to defeat all of the ducks. Print out the starter worksheet and click play on the game. Fill out the front page of your ‘Blockly Pond Challenge’ Worksheet. Watch each of the enemy ducks. You need to code your duck to attack the enemies, but how are you going to code it? Does your duck kill all the enemies without dying? How long does it take. Are there any improvements you can make? Compare your code with the rest of the class, how do it compare? How do their algorithms work? Which algorithm is kills the ducks the fastest? Which is the most reliable algorithm?